It was going to happen sooner or later; the stunts have begun. The little Honda CRF250L has been a proper workhorse for us this last month or so. It has proven its worth charging through London city traffic, having enough poke to get away from the scooters, with a maneuverability advantage that leaves the parker patrol far behind. It’s coped with several 30-mile motorway slogs, held wide open for what seems like a lifetime without ever missing a beat. Top speed we’ve seen so far on the speedo was 89mph; pretty respective for a 250cc four-stroke trail bike. And with the knobbly tyres you don’t really want to go much faster. In the leafy lanes, the challenge of keeping momentum through every turn never gets boring. Get it onto the dirt and it’s as soft an introduction to off-roading as you’re going to get. There’s never more power than you need and the soft suspension is just the job for low-speed mudding. 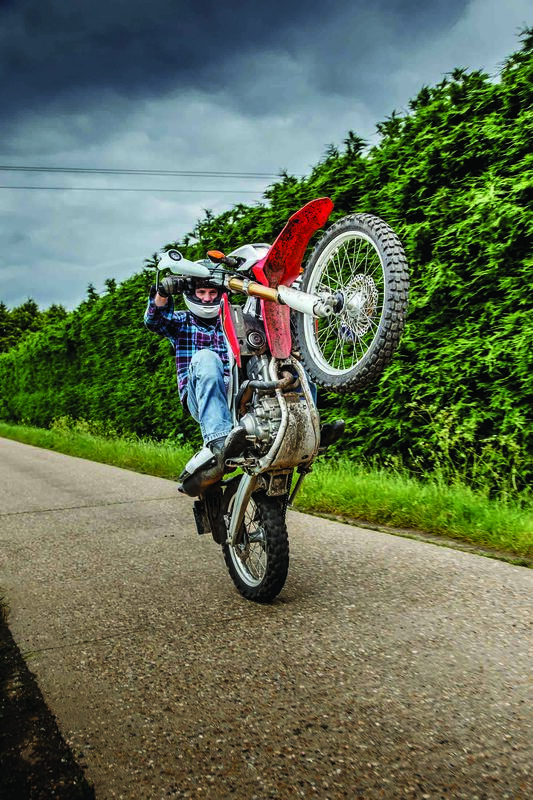 Will a CRF250L wheelie? Does the (Shaun) Pope have a Monster Energy addiction? But we’re easily distracted here and it was always inevitable that the CRF would be pushed into stunt-practice duty before long. There’s enough grunt to get it up to a balance point wheelie and the wide bars give you half a chance of holding on to it. Plus it’s light enough that when it gets away, you can just man handle it back into place. When you’re bored of wheelies (as if) skid turns become the next trick to learn, sliding it round on the back brake, pinging the clutch and drifting it back out. Stuff you’d not normally dream of doing on a £12k sports bike, but this thing is perfect for it. And the CRF has a secret weapon when it comes to practicing your stunts, its exhaust. It’s so damn quiet you could hold it on the rev limiter and the PCSO still wouldn’t have to raise his voice to ask what you’re up to. You can have all the fun you like and there’s no noise pollution to alert people to just how much of a laugh you’re having, perfect. Banging pics thanks once again to Phil of the Steinhardt variety. Skids: Wore a hole in my trainers, so lots.